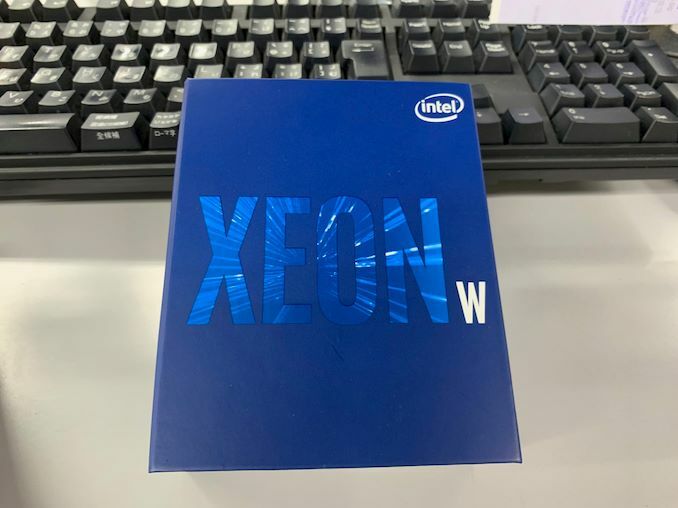 One of the comments we got from Intel about the new unlocked 28-core Xeon W-3175X processor was that it would only be available through boutique system integrators or OEMs, like Dell or HP. It now transpires that Intel is intending to sell these processors with full retail packaging. As spotted on Twitter, the parts have already been showing up in the Tokyo Tech Plaza in Japan, for an eye-watering $3880 (plus 8% JPY sales tax). 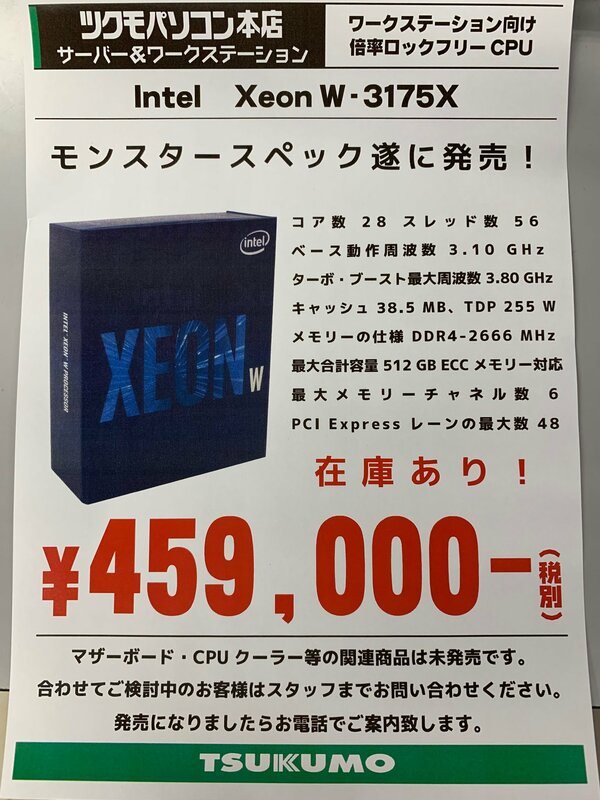 Intel’s new behemoth, with an announced RCP of $2999, is now available at (and posted on Twitter by) Tsukomo PC Honten, a computer store in Tokyo, Japan. The store is selling the CPU for JPY ¥459000, which if you take out Japanese sales tax comes to $3880. The store states on Twitter that they do not have access to the ASUS Dominus Extreme motherboard yet, the only motherboard that currently supports the processor at this time. When speaking to ASUS, as of two days ago, they stated that the Dominus Extreme was only going to be available to system integrators and so there is not an official MSRP for that product at this time. That hasn’t stopped some retailers waiting for orders of the motherboard to come through, to perhaps sell the board on its own as an OEM-only part. Listings for the motherboard have appeared on ShopBLT and CompSource, with prices of $1728 and $1799 respectively. With that being said, several users have delved into the new Dominus Extreme BIOS code and looked at the relevant microcode patches to enable the W-3175X. 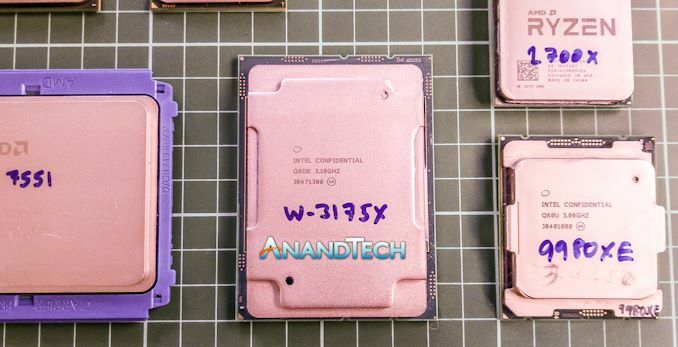 The idea has been floated that the relevant microcode that enables the CPU could be transferred to another LGA3647 motherboard, such as the ASUS WS-C621E-SAGE, however no-one has tried it at this time, at the risk of breaking an expensive CPU and expensive motherboard in the process. We are still waiting for GIGABYTE to finalize their motherboard for this processor, however the timeline for the production and retail of that board is unknown at this time. At CES, it was clear they did not have the board ready based on conversations we had. So now we play a fun game. A new high-end halo processor is now available at retail. The question is if the motherboards will be (or not), or if current LGA3647 motherboards on the market will be updated. Don't forget to read our review of this new Intel halo processor! Waiting to see how this cpu performes in CINEBENCH R15 EXTREME! - Unofficial MOD for the community to Stress HEDT platforms. Intel is selling this chip as a marketing chip and nothing more. Of course for some people this doesn't matter. What it matters for them is that they need it and they have the money to buy it and use it. The 9900K is the same thing. A $550 desktop processor? For what? That's maybe 10% faster than a chip half its price? Intel wants to have its cake (volume) and eat it, too (margins).